I shall be at Willesden Magistrates Court tomorrow morning for the Heathrow 13 solidarity protest because I want the brave, non-violent climate activists to know they have the full and unwavering support of the Green Party, which I am proud to serve as Deputy Leader. We stand up for the activists just as they are standing up for our planet and our future. It is unjust that those fighting for a safer climate for all of us are, in all likelihood, headed for prison tomorrow for their peaceful protest actions. Ahead of tomorrow morning’s sentencing, the Heathrow 13 have been warned by district judge Deborah Wright ‘to expect an immediate custodial sentence’ for aggravated trespass. Is not this government’s seeming determination to ride roughshod over climate change considerations with its environmentally unfriendly policies a ‘trespass’ on our and future generations’ rights? The government and judicial system should be cracking down on unchecked climate change rather than peaceful protesters. Even if the Heathrow 13 are incarcerated, the Green Party will ensure their voice resounds and resonates. As the only party opposed to all airport expansion and the only party who place environmental sustainability at the heart of everything we do, we will continue their essential call for urgent climate justice. 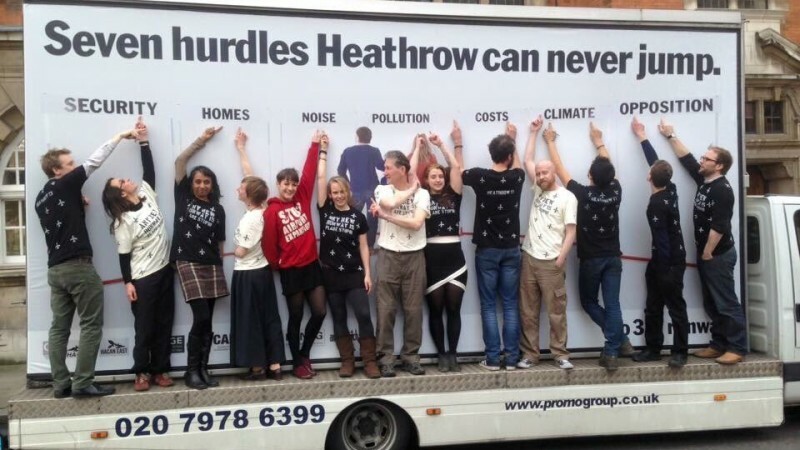 Greens and the Heathrow 13 know that bigger airports make zero climate sense. The UK simply cannot make its contribution to cutting carbon emissions while expanding its airports and increasing emissions from aviation. If this government is in any way serious about delivering on the promise of the Paris climate talks, and delivering genuinely climate-sensitive policies, then airport expansion plans must be immediately shelved. The Green Party is calling for other measures to be explored, including encouraging short-haul flight passengers on to existing rail services and introducing a frequent flyer tax. The solidarity rally will doubtless be attended by Londoners who live close to Heathrow. As the activists have underlined, local residents will suffer enormously from increasing noise and air pollution, the ‘silent killer’ of thousands of Londoners each year. Like other Greens, I find it scandalous that areas of our capital have already breached annual pollution limits for 2016. And as a Green candidate in this May’s London Assembly elections I will do all I can to escalate the urgent issue of air pollution and campaign for urgent action to tackle climate change. It is the very least I can do to honour the Heathrow 13. You have our full support – we hate to see the way the UK is heading with this Government. It seems to be returning to the Thatcher years. Then we the people challenge david cameron on all counts. His broken promises. H. A. A. R. P needs to be exposed and addressed. This parliament controls climate change. We need a reformed parliament.